Welcome to Fred Haas Toyota World's Commercial Fleet Department! Whatever your business may be, we're sure we'll find the right fleet vehicles to suit your every need. 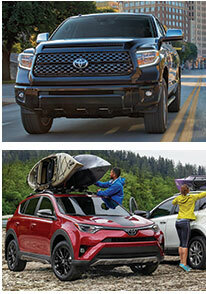 We have the LARGEST Toyota inventory in Texas* and the largest selection of Tundras in the World. * From vans, passenger vans or trucks, we have what you're looking for! Plus, don't forget every purchase comes standard with Toyota's 2 year no cost maintenance through ToyotaCare. Whether you are looking for fleet vehicles for your swimming pool services, pest control corporations, landscaping companies or you are in an industry requiring ladder racks, utility beds and special applications, we guarantee to provide exceptional services at unbeatable prices! We guarantee to be your one-stop shop for any & all commercial fleet needs and we proudly ship nationwide. Whether it's a car, truck, van, SUV, businesses across the nation have trusted Fred Haas Toyota World to supply all their transportation needs. - Performance Exhaust & More! We ALWAYS have fleet incentives valid on your next purchase! Make sure to check-in with your Fred Haas Toyota World representative for the latest rebates and incentives for your next commercial van, car, truck or SUV purchase. At Fred Haas Toyota World, we are confident that we will find the right match for you so we proudly offer several demo/test drive options to meet your needs! Stop by Monday through Saturday and speak with one of our Commercial specialists today! *Claim based on Total Retail Sales volume per GST 2003-2016 for Fred Haas Toyota World. To find out more about our commercial fleet services, fill out the form on this page.